It takes just a few simple ingredients to make homemade hummus—chickpeas, olive oil, lemons, garlic, paprika and tahini paste. Make your own tahini paste by toasting sesame seeds in a non-stick fry pan, being careful not to burn any. Put toasted seeds in a in blender, adding olive oil to desired consistency. 1 cup sesame seeds makes about 2/3 of a cup of tahini. Experimenting with flavors, such as roasted red pepper, olives, toasted pine nuts, cheeses or sun dried tomatoes. I found you can pretty much mix anything in a chickpea base and create a wonderful flavored hummus. In a blender or food processor add roasted peppers, garlic and cayenne. Puree until smooth. 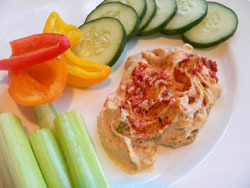 placing the reserved roasted pepper puree in center of hummus, swirl slightly. Dust with dill. Serve with pita chips and cut vegetables. In a blender or food processor add cucumber and tomatoes. Puree until smooth. placing the reserved cucumber/tomato mixture in center of hummus, swirl slightly. sprinkle with olives and feta. Serve with pita chips and cut vegetables. In a blender or food processor add first 4 ingredients. Puree until smooth. Spoon onto a serving platter or bowl placing the reserved tomato mixture in center of hummus, swirl slightly. Serve with pita chips and cut vegetables.